Gotland Game Conference is an exhibit in Visby letting you experience entirely new video games, arcades and computer animations! The exhibition floor is an opportunity for future students to meet our current ones and see what kind of work you’d get to do here. For the industry it’s a meeting with your future workforce and a discussion about their curriculum. For press and media the show is a presentation of a mature Swedish game education with global and commercial relevance. Gotland Game Conference is our proud annual highlight: a drum roll and high-hat emphasizing all the hard work of the year gone by at Gotland University’s GAME department. Download our banners and posters! We are GAME – the game design- and development education at Gotland University, Sweden. The education is located on the island of Gotland in the World Heritage city of Visby. Gotland University offers both campus and net-based distance learning in a wide array of subjects, the university’s motto is “Passion and Science”. 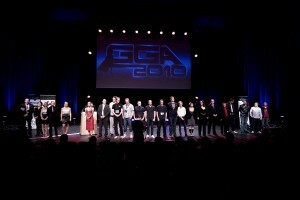 The GAME department has been teaching game design, programming, computer graphics and animation since 2001. We’ve arranged the Gotland Game Awards since 2006. Wondering what happened to the GGA?